After Doritos announced they were releasing a new rainbow-coloured version of the popular snack – U.S. only, unfortunately – the internet’s many bigots have taken to airing their views. The multi-coloured crisps are being sold in aid of the It Gets Better Project, an organisation that was set up to help LGBTQ youth around the world. 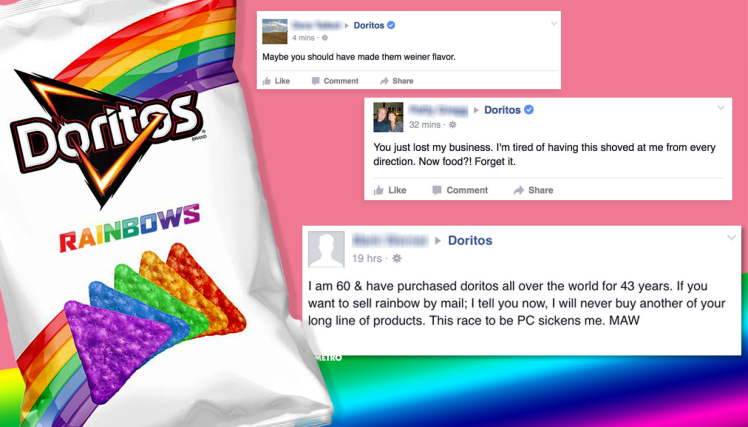 Homophobes didn’t take the news of Doritos new ‘blasphemous’ snacks very well, and let the company know this via social media. But don’t worry, comedian Mark Melgaard was on hand to troll the bigots, via a fake account he set up called ‘Doritos ForHelp’. And it turns out the people outraged that Doritos are supporting the LGBTQ community couldn’t tell that they weren’t getting official responses from the real company. Who’d have thought it? I think many find [these posts] so appealing because I’m just openly calling this nonsense out for what it is. It’s amazing how many people are just waiting for the one person to come along and really say what everyone already wants to say. And, to top it off, there are those who really believe I’m a real help-desk person! I mean, it’s hilarious when you have a full out conversation with Dora and she ends it with, “Stop Deflecting, Doritos.” I’m still laughing over that one. Someone doesn’t know what Phallic means..